Halloween is only a week away! Still scrambling for a costumer for your little one? 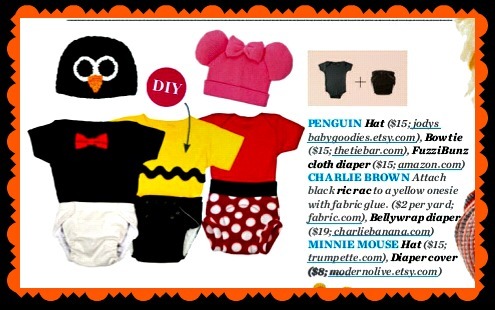 Check out these ideas from the October 2012 issue of BabyTalk magazine. I love these ideas! My little one will be dressed like a puppy, but we won't be using a cloth diaper as part of his costume. What about you? What will your little ones be this year? Anyone using a cloth diaper as part of their kid's costume? It's way too cold here to use a diaper as part of the costume, unfortunately. Those ideas are so cute! N will be a monkey this year.